Crunchy on the outside while tender on the inside. 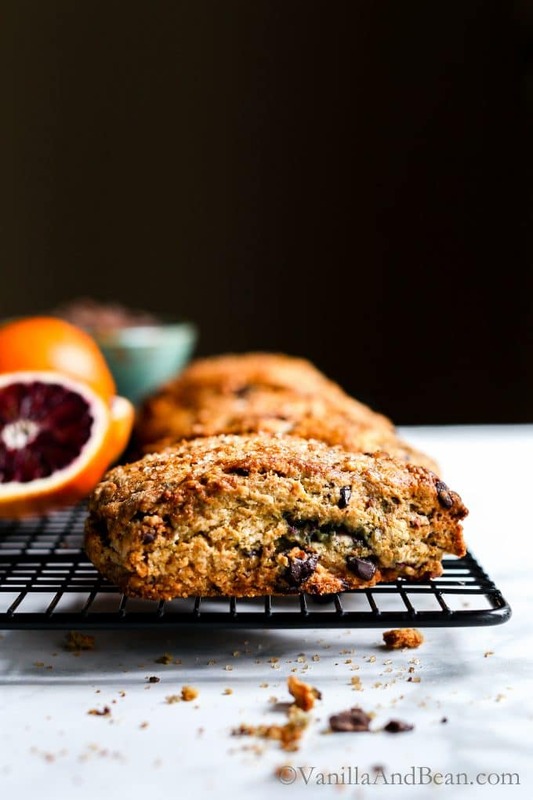 Blood Orange Chocolate Chunk Scones are easy to make and a delight during citrus season. Make ahead and freeze for the ultimate convenience! 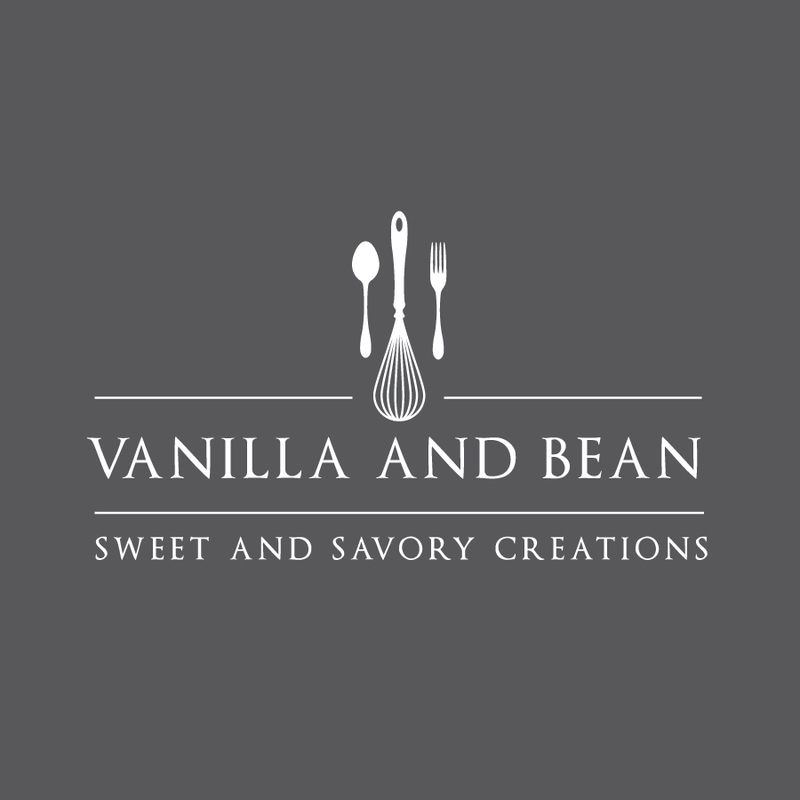 It’s been almost two years since a scone recipe has appeared on Vanilla And Bean! Unbelievable given how much I adore them. The first and only other scone recipe on the blog is Pumpkin Scones with Candied Ginger and Maple Glaze and they are dreamy. I make them as often as I can get away with. 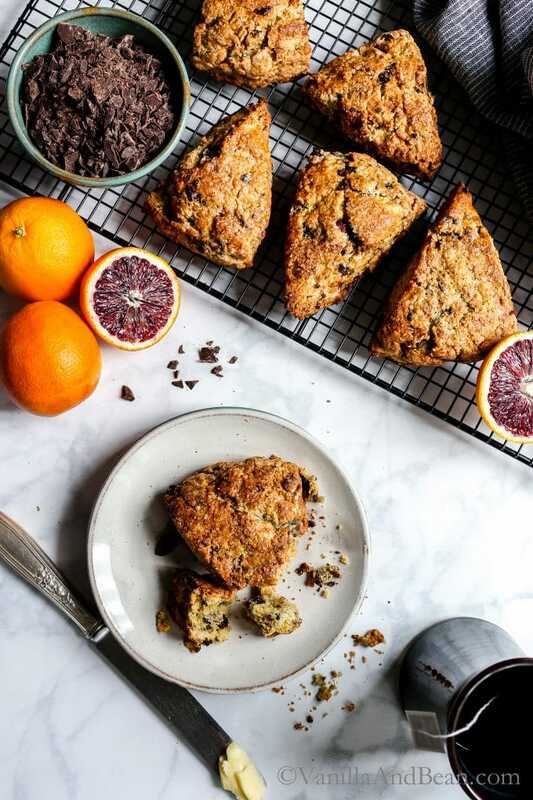 Blood Orange Chocolate Chunk Scones came to mind when I spied blood oranges for the first time this season. 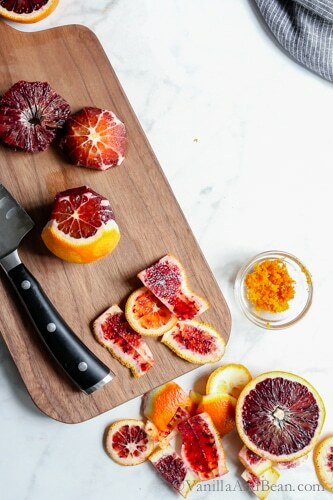 I absolutely love blood orange recipes. Not only do they highlight the season’s freshest ingredients, they’re just beautiful to look at given the grey days of winter. I initially started developing a blood orange almond tea cake, then got sidetracked to this recipe. 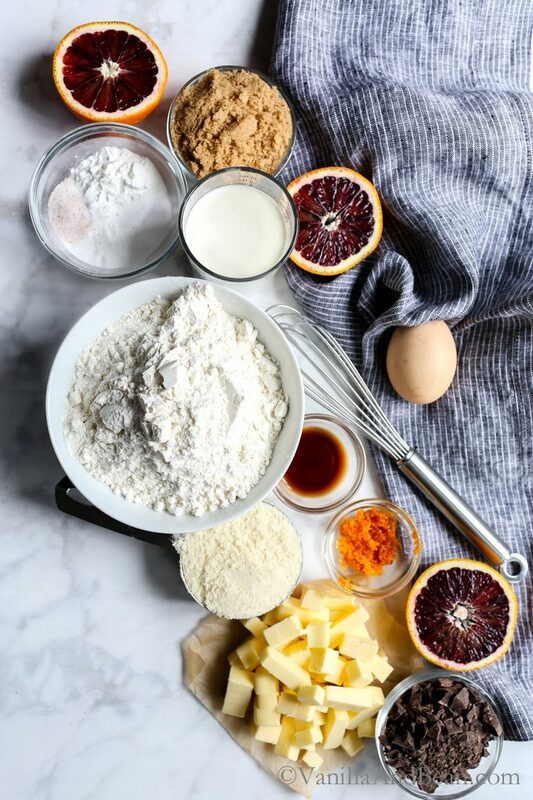 Blood orange scones are lightly sweetened with brown sugar but the addition of dark chocolate sweetens the scones a bit more, just enough to balance the bitter blood orange notes. I’ve included almond meal/flour for its nutty flavor and texture and to tenderize the scones. You’ll notice corn starch (always organic) in the ingredient list. I add this ingredient quite a bit to my baked recipes simply because it does two things I love. It helps yield a crunchy crust and takes inside tenderness over the top! Get ready for an overzealous (!!) 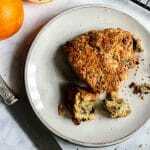 number of photos in this post to share just how easy blood orange scones are to make with the simplest ingredients. I’m a little excited about these tasty treats… can you tell?! 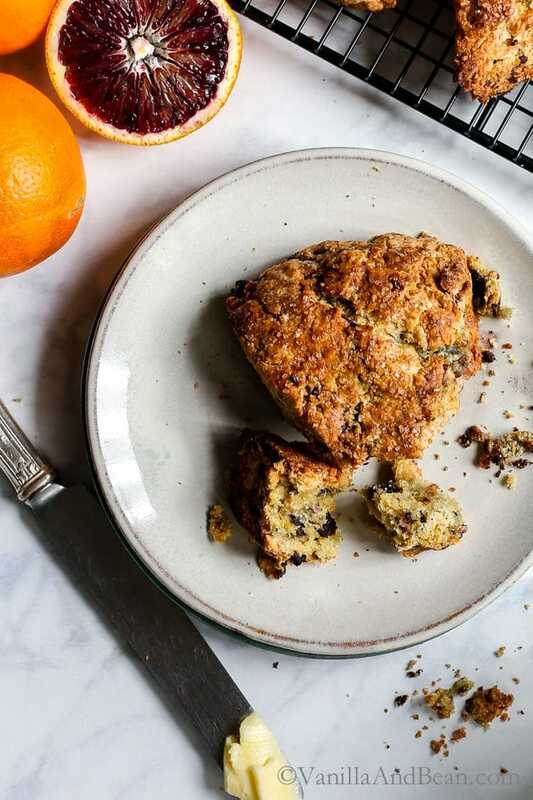 After gathering your ingredients for this blood orange scone recipe, zest, peel and chop the citrus, retaining all the juices; we’ll mix that into the wet ingredients. Sift the dry ingredients together, then cut in the butter to about pea to almond size. I like to use a pastry cutter for this job. Mix the wet ingredients together, then add them to the dry ingredients, including all the juices and zest from the citrus. Take a deep inhale…… and melt over the scent of vanilla and citrus. Next, gently mix with a spoon. The ingredients will feel dry. Add the chopped chocolate and blood orange. Start folding and pressing the mixture together, just a few times. When you can take a fistful and squeeze and the dough holds together, it’s time to dump the dough out onto a well-floured surface. Using a bench scraper really helps here. 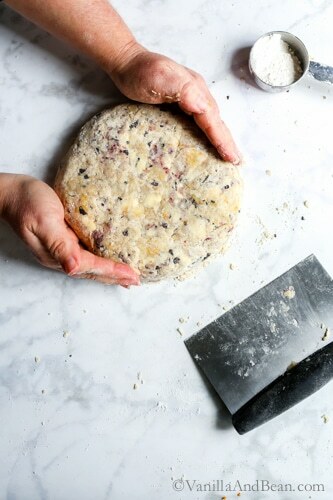 Take the dough and fold it over on to itself several times, patting and eventually shaping it into a 1″ (2.54cm) thick disk, using the bench scraper to gather bits and pieces. The dough will seem dry, but press on. Use a large chef’s knife to cut the dough into 8 equal pieces using firm pressure in one downward motion (do not saw). 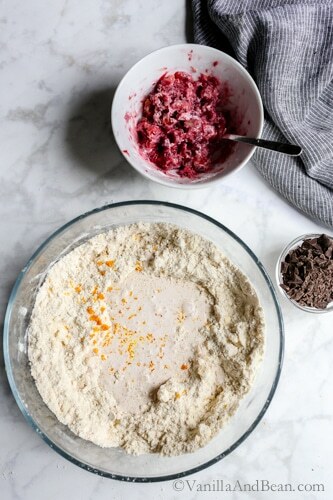 Gently transfer these blood orange scones to a parchment-lined sheet pan and chill while the oven is preheating. At this point, the scones can be frozen too! Imagine an easy weekend brunch or afternoon tea. 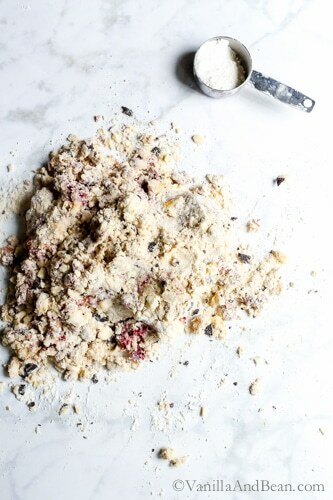 Before baking, egg-wash the scones and sprinkle the tops with raw sugar such as Turbinado. Bake for 20-25 minutes. Serve warm with clotted cream or orange marmalade. But they’ll stand on their own deliciously. 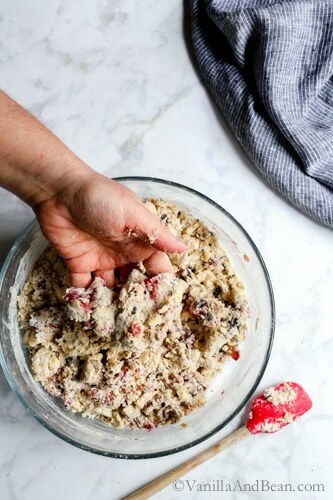 What’s your favorite scone flavor or recipe? Please drop a link below and share! Crunchy on the outside while tender on the inside. 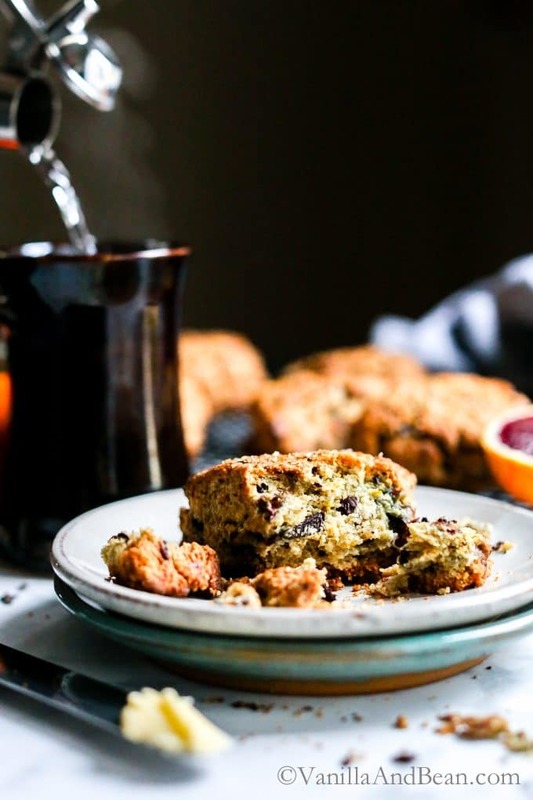 Blood Orange Chocolate Chunk Scones are easy to make and a delight during citrus season. Can be assembled ahead and frozen up to one week in advance. *Time below does not include time to rest scones in refrigerator. Line a sheet pan with parchment paper. Cut the cold butter into 1/4" (6mm) cubes and place in the refrigerator while prepping the other ingredients. Zest the oranges, peel and chop the flesh into small pieces taking care to reserve the juices from the oranges. 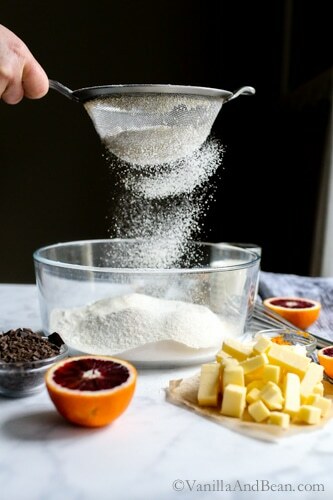 Place the flesh into a small bowl and add 1 Tbs of all purpose flour to the blood orange flesh. Stir to coat. Set aside. In a measuring cup mix the cream, and vanilla extract. Add the zest and pour the orange juice into the measuring cup with the cream and vanilla mixture. Set aside. Sift the remaining all purpose flour, almond flour, corn starch, brown sugar, baking powder, baking soda, and salt into a large mixing bowl. Add the cold butter to the sifted ingredients and use a pastry cutter to cut in the butter into the pastry. (You can use your fingers here, but I like to keep the butter as cold as possible). The butter should be about pea size, evenly coated, and distributed in the flour. Pour the wet ingredients into the dry ingredients. Gently stir the mixture until the flour is just moistened. The dough will be shaggy and seem dry. Add the chopped chocolate and the chopped blood orange pieces. Fold in to incorporate, eventually using your hands to press and fold the dough together, just a few times. Squeeze a portion of the dough in your fist. It should loosely hold together. 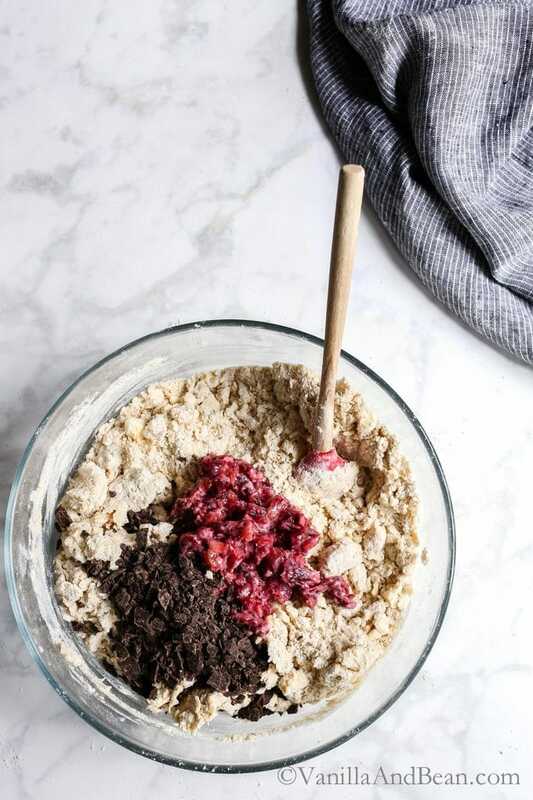 Dump the contents out of the bowl onto a flour dusted work surface and start folding the dough over and onto itself 10-12 times (this helps build layers), while eventually pressing the dough together forming a circle. The dough will seem dry at first, but as it is folded it will begin to hydrate. 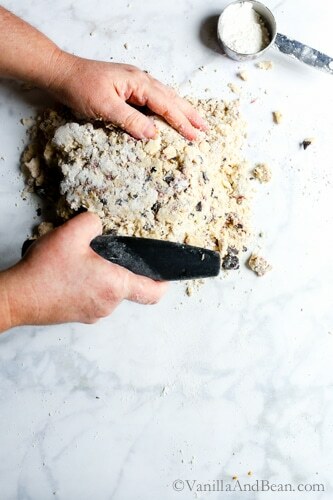 Use a bench scraper to help you gather the bits of dough and to fold the dough over onto itself. 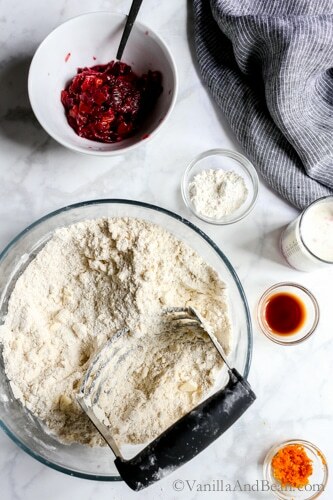 Work gently, but quickly as the dough needs to stay cold and overworking the dough can cause the scones to flatten while baking. If the dough becomes sticky pop it in the fridge for 15 minutes to chill. Pat the dough out to 1" (2.54 cm) thick circle and cut into 8 wedges using a large knife with one downward cut - no sawing here. Place scones on the parchment lined sheet pan and rest in the fridge for 20 minutes, while the oven is preheating to 425F (218C). At this point, the scones can be held in the fridge overnight for a quick bake in the morning. Or, they can be held in the freezer for up to one week - thaw overnight in the refrigerator. Just make sure they are wrapped tightly. Before baking, prepare the egg wash by whipping the egg and water. 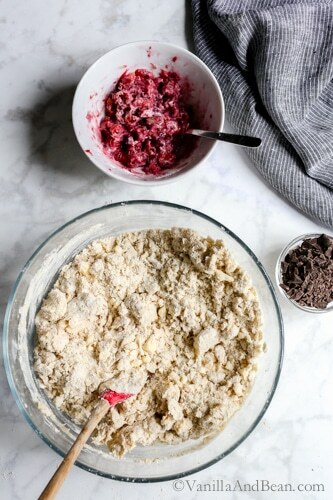 Use a pastry brush to brush the egg mixture over the scones. Sprinkle the raw sugar evenly over the top of each scone (it's for the crunch!). Bake for 20 minutes at 425F, then turn the oven down to 375F (190C) for an additional 4-5 minutes. (I like my scones dark and crusty, so I press on right up to 24-25 minutes, but this will vary due to oven differences, so just keep an eye on them starting at 20 minutes so they don't burn). 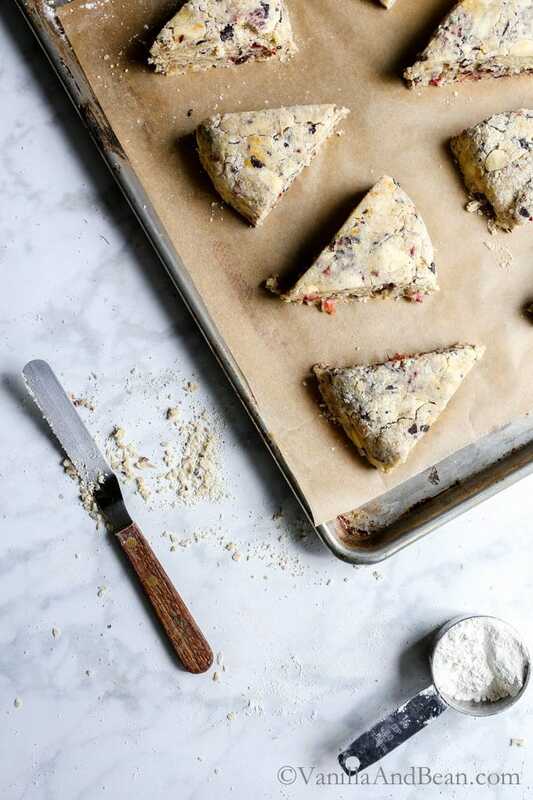 Remove from oven and carefully transfer scones to a cooling rack. Best served fresh and warm. *To make sure only chocolate chunks are going into the scones, use a sieve to filter out all the finer pieces of chocolate. Then use the larger pieces for the scones. To rewarm the scones, place in 350F oven for about 5-8 minutes. Hello! Can regular flour be used instead of almond flour? Hi Danielle! I added a bit of almond flour to enhance the texture and flavor of these scones, but regular flour should stand in just fine (although I’ve not tried it). I hope you enjoy the recipe Danielle! Thank you so much Ursula! Their season is sooo short… I hope you enjoy the recipe! These look so amazing. Do you have any suggestions for a vegan version? Hey Lisa! You could give full fat coconut milk a try for the cream, if you’re okay with a coconut taste and, although I’ve not tried it, Earth Balance for the butter. I hope this helps! Me too Beeta! Anything with Chocolate, right? Thank you Chey! 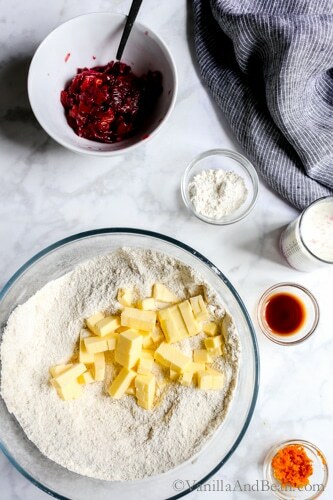 I’m with you on scones… a weakness for me :D Blood orange season is coming to a close quick.. I hope you get a chance to make em! I love the blood orange and chocolate combo too. Hope you were able to enjoy a few of these before everyone gobbled them up! I never mind when you’re overzealous with your photos; the more the better! I love the classic combination of orange and chocolate(!) especially packaged up in a perfect little scone! Of all the things to bake, scones are my most favorite. Traci! These are goooorgeous! I’m so loving the combination of orange and chocolate. They go so well together. And that crunchy top and buttery crumble? Hmmmm…these are happening today! Agreed, Caroline. They are so easy and can take on a vast array of flavors! I think if I had to pick a fave breakfast treat, it was be scones for sure. Chocolate and orange are such a sweet pair together and that glittery sugar adds the perfect finishing touch. I’ll have to try your cornstarch trick! So many wonderful photos in this post- it all comes together so beautifully. The sugar for the crunch, right? I’d love to hear what you think about the cornstarch, Emily! Gosh, Traci – these scones look gorgeous! Lovely crust and delicious flavor combo – orange and chocolate a m fave! I’ve got some honeybells to use up so this post is perfect timing! Hope you’re having a great weekend! I used a lot of exclamation points in this message – lol! Wow, Traci, these are gorgeous! I love the combination of almond flour and white flour you used. Definitely going to have to try that with my next scone creation! Almond flour is SO good and yields a nice texture to the scones. I hope you enjoy the recipe Liz! These scones are so mouthwatering Traci! I’m going to attempt them very soon! And thank you so much for letting me know what that darn kitchen gadget is called! A bench scraper!!! Ahhh!!! I’ve always wanted one of those!!! So embarrassing but true. Now I can search Amazon and get one. lol!! I can’t believe it’s been two years Traci. Well, I’m sure glad you decided to share these! The blood orange and chocolate combo is definitely a winner. I have never added cornstarch to my scones, but I will definitely be giving this recipe a try to see the difference. Your photos today are just stunning! Happy weekend! Thank you Mary Ann… agreed, citrus and chocolate combo is a winner! Never even thought of using cornstarch in scones before, but that’s inspired. I’ve also never thought about baking oranges with chocolate, and that’s even more inspired. These look amazing, love me a good scone! That blood orange and chocolate combo sounds like a winner to me! I’m in for chocolate anything, Kevin… but the blood oranges are like the icing on the cake! Eeeek! I’ve been waiting for these ever since you teased me with them! Guess great minds think alike, right? They are gorgeous and of course, I’m digging the dark chocolate. Should we trade scones, maybe? Lol! Gorgeous, as always. 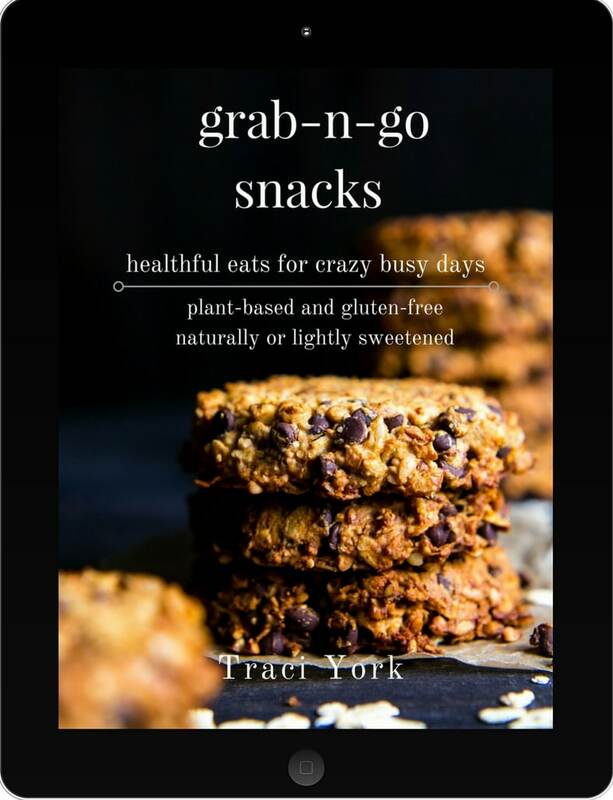 Your recipes make me hungry, Traci! Awwwh, you know the scents of citrus and vanilla together… it’s one you’ll never forget and often crave! Thaaank you Claudia! OMG… Laura… the word, irresistible. I can’t admit how many I ‘tested’ LOL!